Where can I find information on PayWhirl webhooks? You can use certain webhooks with PayWhirl to receive push notifications. Here is a complete list of webhook events. Certain third party applications will ask you to register your webhooks on PayWhirl. In order to do this, simply paste the webhook URL into the field provided. Note: You may need a developer's help to integrate your services with Paywhirl's webhooks. 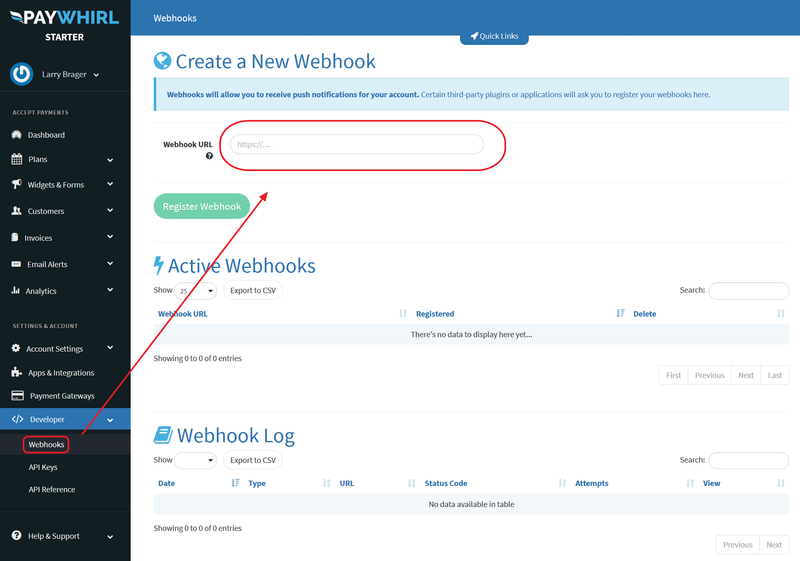 Webhooks can be setup in the Developer section of your Paywhirl dashboard. You may include multiple webhooks under one account if you need to send them to multiple processing scripts or applications. Paywhirl's webhooks can be processed by your server-side scripting language of choice and can be used to interact with any 3rd party service via their API. Common uses for webooks include processing orders with a fulfillment service, adding customer records to your website, or sending automated emails when an action occurs in your Paywhirl widget. Webhooks give you the flexibility to integrate Paywhirl with any other web service, including, but not limited to, your own website. Webhook data is sent as JSON in the request's body. The full event details are included and can be used directly. We also advise you to guard against replay-attacks by recording which events you receive, and never processing events twice.